Press: http://www.cambridge.org/uk/catalogue/catalogue.asp?isbn=9780521719001. It consists of a very major revision of the first edition, which appeared in 2000. 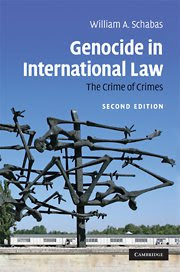 The second edition reviews the very important case law on genocide since 2000, the substantial academic contributions and the political developments, such as recognition of the doctrine of the responsibility to protect. Enough Prosecution of War Crimes in Germany? Gaza Prosecutions before the ICC?